Aleksandra “Ola” Trzaskowska and seven of her off-road riding buddies have just got back from a two-week adventure in the heart of Georgia, a small mountainous country wedged between Russia, Turkey, Armenia, and Azerbaijan. “I love riding in the mountains, and most of the time, I choose to lead all-female motorcycle expeditions in the Himalayas or Central Asia. The trouble is, the Himalayas are far away, and Kyrgyzstan and Tajikistan, while offering incredible riding, are just less accessible. Having visited Georgia previously on skiing and biking trips, I figured it would be perfect for what we wanted to do “, - Ola explained. Georgia is conveniently close to Europe, and according to Ola, it’s both wild enough to have a crazy off-road adventure and developed enough to offer such comforts as good hotels, ATMs, supermarkets and excellent infrastructure. “You can ride for days in complete wilderness, and then you get to a place like Batumi which the locals call the “Dubai of Georgia,” a busy, touristy town packed full of casinos and nightclubs. I have a feeling that Georgia might become a very popular destination for European adventure riders, much like Morocco is now”, - Ola said. 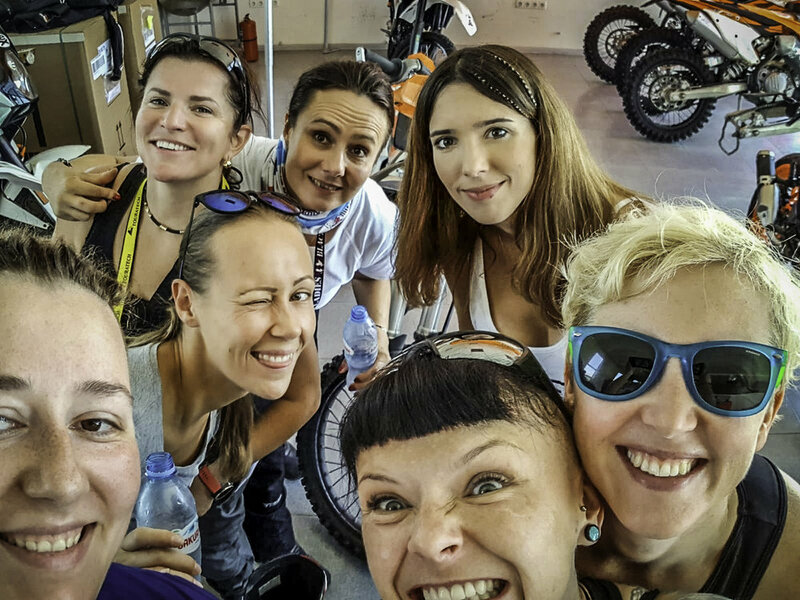 Renting eight KTM350 and 450 motorcycles, Ola and her gal pals set out across the Caucasus mountains, riding off-road as much as possible. Tackling steep, rocky mountain passes and enjoying the undulating seas of high grass in the steppe, the intrepid adventurers avoided bigger cities and stayed in small homestays in local villages. “For this trip, I hand-picked women who I knew were confident off-road riders, because Georgia can be challenging. It’s a wonderful and diverse country: looming mountains and rolling hills, ancient ruins and forgotten churches just out in the middle of nowhere. We loved to have the place to ourselves!”, - Ola said. According to her, Georgians are incredibly hospitable and generous: whenever they encountered locals, the women always stopped for a chat and rode away with gifts: ripe grapes, offers to eat dinner together or just friendly waves. “Georgians are very open and friendly towards tourists. However, it’s still a very macho country. Everything’s great as long as you’re just talking to people, but the minute you start demanding something, like your rental bikes to be ready on time or your hotel rooms booked, the locals get pretty difficult. The concept that women can travel independently and ask for things, as opposed to standing behind a man and nodding politely, is still very new in Georgia, so we did have a few difficult moments. Other than that, though, Georgia is great! The hospitality is absolutely unmatched”, - Ola recalled, smiling. If you’re headed to Georgia, forget dieting – the food here, according to Ola, is to die for. 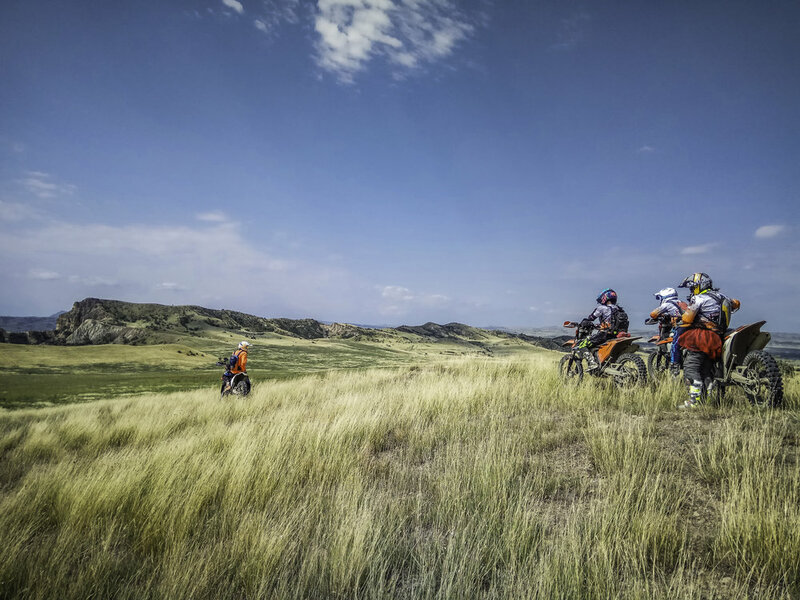 Grilled meats on skewers, the famous khachapuri – cheese-filled bread – and local wines are so good that even hard off-road riding won’t keep the pounds from piling on. “The Food in Georgia is so delicious. And not just for meat eaters – Georgians are very creative with vegetarian options, too. And the best part is, you don’t need to go to fancy restaurants to dine well. Any grandma in the tiniest mountain village is perfectly capable of preparing a feast!”, - Ola said. Although Georgians love bikes, adventure motorcycling hasn’t made it to the Caucasus just yet. “I think Georgians are only starting to appreciate their own country now, especially seeing foreigners visiting on motorcycles”, - Ola noticed. For the most part, she and her posse navigated using tracks found on Wiki logs and Google Earth, as well as using recommendations from ride reports online. “Off-road riding is pretty tough in Georgia because the mountains are high, so the tracks are pretty narrow, steep, and rocky. We had to change our route once because the track was so washed away and so muddy; we could have done it, but as it’s cold in the mountains, we just didn’t feel like riding in soaking wet gear all day long. The main roads in Georgia are paved, and they’re paving most of the gravel and dirt roads leading to tourist destinations. But those remote mountain tracks will remain wild for a very long time, I’m sure”, - Ola said. This time around, the gals didn’t bring any camping gear. After a hard day’s ride, everyone just wanted a real bed, so they stayed in small guest houses and homestays in little villages. “Accommodation in Georgia is plentiful and easy to find. In bigger towns and cities, there are lots of options available, from basic lodging to luxurious hotels. But even out in the sticks, there’s always someone offering room and board, even if it’s a tiny village”. Ola said the group had no bike trouble during the two weeks of riding – but the conditions on the roads were sometimes a little tricky. “What you need to be cautious about in Georgia is animals on the roads – cows, dogs, and donkeys are just everywhere. Georgians aren’t the most civilized drivers either, and now that they have new, powerful cars, they drive like crazy even on narrower mountain roads, so it’s better to avoid places with traffic if you can!”, - Ola warned. Riding off-road, though, the only traffic they met were people riding horses.